Net Weight: Packet (1500 seeds)1/4oz (21500 seeds)(+$7)1oz (86000 seeds)(+$12)1/4lb (344000 seeds)(+$45) This item is currently out of stock! This low spreading succulent produces vividly colored blooms for weeks in the late spring and summer. Sometimes called ice plant as it is covered with papillae which resemble small crystals. Ideal for mass planting and rock gardens. 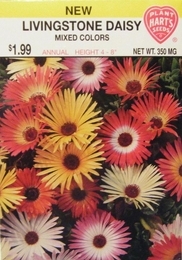 Livingstone Daisy prefers full sun and sandy soil. They tolerate drought and salt spray making them good for sea and roadside plantings. Thinning - when plants are 2-3 inches tall thin to 6-10 inches apart.